While some people think their days of hiking are “on hold” once they become parents, that’s just not the case! There are still plenty of adventures ahead for both parents and children. If you’re a hiker with young children, you don’t have to put your hobby on hold until they head for college. And if you’re a parent who is new to hiking, there couldn’t be a better time to start! Spending time on the trail offers a world of opportunity for family outings and vacations. Not only will your family grow closer, but you can introduce the next generation to all that trails offer for personal growth and education while making life-long family memories. Have fun and be flexible. If this is your number one goal, everyone will be happy. Remember that you are trying to introduce your family to hiking; they won’t want to do it again if they don’t have fun the first time. Change your plans if things are not working out. Give the kids some control. Let the kids set the pace and allow them to make some choices along the way. Let them decide which trail to take or where to stop for lunch. They will naturally want to explore their surroundings and examine new bugs, spider webs and birds. You could carry a few toys for them to play with out on the trail if they seem to get distracted. Better yet, see if they can make their own inventions using only things they find on the trail, such as a few rocks, sticks, leaves, etc. Just make sure to put it all back when you leave. Bring snacks and plenty of fluids. Make sure to stop and drink frequently. Kids may be so interested in their new environment that they don’t realize how thirsty they are. High energy foods and plenty of water will keep them in good spirits. Dress yourself and your children in layers. Be aware of your child’s body temperature. If you are carrying a child, he or she may be cold while you are burning up. Or conversely, you may feel chilled while your child is warm from running around and playing. If you have several kids, especially ones that may want to run ahead, dress them in bright visible clothing so you can more easily spot them. Pick a short, interesting hike and allow lots of time. Choose a trail with a destination such as an overlook, waterfall, historic site, stream or lake. Allow them time to investigate interesting things along the way. To start, choose a place close to home so your children don’t get restless on a long drive. Teach, sing, and play games with your kids. 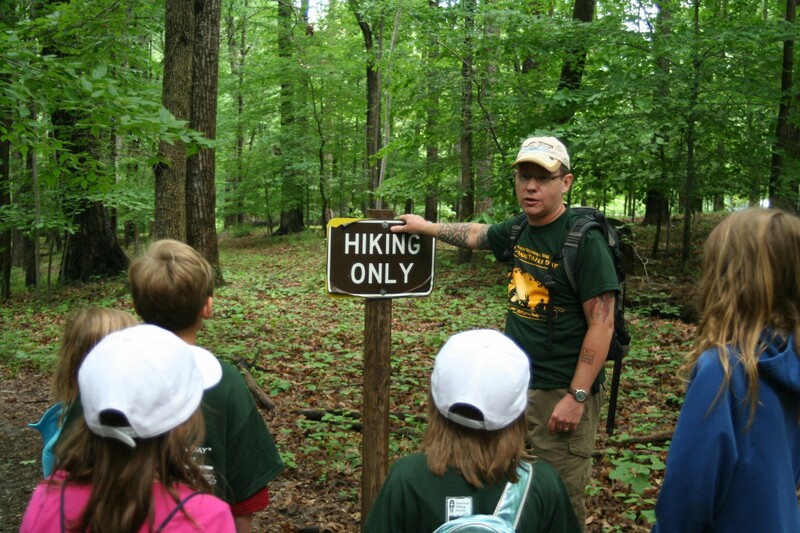 Discuss how long the trail is, trail etiquette, signs of impending weather, how to use a compass and read a map, and how to identify plants and animals. Safety first. Give each of your kids a small pack with a healthy snack in it as well as a kid-sized water bottle. They may also be old enough to carry their own jacket in the pack. Importantly, put a safety whistle in each pack. (If the kids don’t have their own pack, attach the whistle to a zipper pull.) Review with the kids – each hike – what to do if they should become separated from you. Ensure that they know stay put and blow their whistle in 3 sharp bursts. Sometimes kids “get it” it better if they’re told to use the whistle to “find Mom or Dad” rather than if they’re lost, since being “lost” is not always readily apparent to them. © 2012, American Hiking Society.